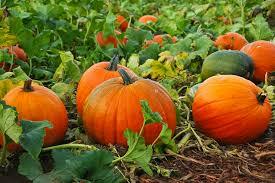 Pumpkins take about 90-100 days to hit maturity, so if you wanted a pumpkin for Halloween, you likely planted during late July or early August. Take care of your growing crop! At this phase of your pumpkins growth, mildew can be a real issue. Solve that with a fungicide. Also strive to keep it out of the soil as much as possible, and rotate it so it grows into a desirable shape. Letting it lean to one side or the other can cause one side to rot or grow unevenly.